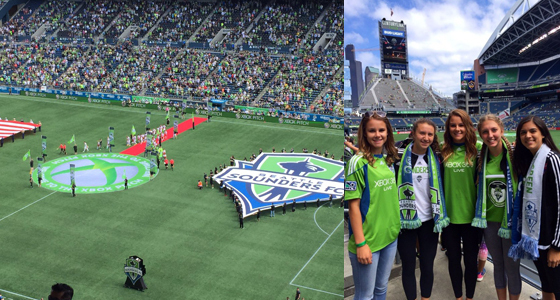 (Aug 2, 2016) We hope you didn't miss out as EYSA and Eastside FC hosted 2016 Match-Day for our Association members on July 31st for the Western Division rivalry match-up between Seattle Sounders FC and LA Galaxy. More than 200 players, friends and family members attended; those who didn't already have Sounders tickets were able to take advantage of the discounted rate offered by the Sounders for our families. Even more exciting, sixty-two youth players from our EYSA soccer clubs were able to experience the game up close and personal; they were awarded an opportunity to join the players at field level, either on the bench during warm-ups, in the pre-game "high-five tunnel," and as player escorts. A handful will be able to be player escorts in an upcoming match, when the Sounders take on Cascadia rivals, the Vancouver Whitecaps in September. The Sounders didn't disappoint during the first game of the post-Sigi-Schmid era, creating lots of opportunities under Interim Coach Brian Schmetzer in the 1-1 draw at Century Link. Mercer Island and Eastside FC alum Jordan Morris played the full ninety. Thanks to the Sounders and their offical youth soccer partners at Eastside FC for making the event possible.